Increased life expectancy will change what retirement looks like. You might have to work into your 80s. But that’s a good thing. 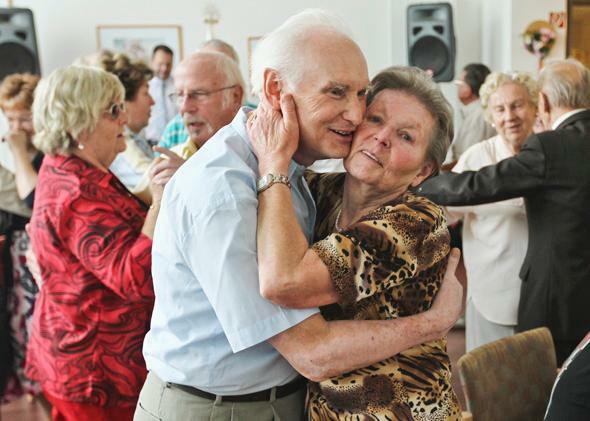 An elderly couple dance at a senior care home in Berlin, on Aug. 30, 2011. Senior citizens make up an increasing portion of Germany’s population, putting greater strain on the country’s ability to finance its public health and senior care programs. Old age isn’t what it used to be. The fabled Age of Leisure that the Industrial Revolution promised may not have transpired for a majority of working Americans, but a select group had hoped to enjoy something that looks an awful lot like it. As they approach retirement, American workers prepare to step back and enjoy their final years. However, the sheer number of retirees, and the cost of accommodating them, is likely to put an end to these dreams before they begin. From 2000 to 2010, the number of over-65s in the United States increased to 40 million from 35 million, and this number is expected to increase a further 36 percent to 55 million by 2020 as the baby boomer generation reaches retirement. This glut of retirees will leave behind neither the economy nor the workforce needed to ensure a safe and secure old age. Like many Western countries, the United States has an aging population as a consequence of declining fertility. As more of the population retires, and lives longer in retirement, the burden on those still working increases. Social Security Administration figures showed that in 2012, the ratio of workers to beneficiaries dropped below 3–to–1 for the first time—the point of stability in the current system—and that ratio is expected to hit 2 workers per retiree by 2030. The cracks are already beginning to show. Earlier this year, Detroit became the largest municipality in history to file for bankruptcy, broken by a weakened economy, spiraling debts, and crippling pension commitments to public-sector workers. What, then, is the future that today’s septuagenarians face as they come to the end of their working lives? The notion of retirement is a relatively new invention. A century ago, seven in 10 over-65s in the United Kingdom were working. Today, about two in 10 are. (Similar changes have happened in the United States.) It was the advent of state pensions by the German leader Otto von Bismarck in the 1880s that led to the idea that your twilight years ought to be spent in a state of well-earned idleness rather than working until you dropped. In the century since, life expectancy has soared, but the retirement age has remained doggedly fixed to this 18th-century standard. “When Bismarck introduced the state pension, life expectancy at 65 was 18 months,” says Andrew Hilton, director of the Centre for the Study of Financial Innovation. “Now it’s 23–24 years for men, 27–28 for women.” The number of Americans entering retirement—and the length of time they’ll spend as retirees—is unprecedented. Among other things, the wealth that is bound up in this older generation will stay there, or trickle out slowly over the next few decades. “As longevity increases, people will receive inheritance later, in their 60s, when it’s not really useful,” says David Sinclair, assistant director of the U.K.’s International Longevity Centre. The knock-on effect of this, he explains, is that elders are opting to transfer their wealth directly to grandchildren, excluding the middle generation entirely. By offloading their accumulated wealth while still alive, not only do retirees avoid paying estate tax, they are able to control how that money is spent, for example, by stipulating the cash gifts be used for a college education. This gives older Americans a much more prominent role in the upbringing of their grandchildren. In Japan, living funerals, or seizenso, have boomed in popularity, offering elderly relatives a way to manage their exit from family life. For those without homes to remortgage or 401(k)s to rely on, the future is uncertain. “We’re not saving enough for social care, and we’re not working as long as we need to,” says Sinclair. Those aren’t uncommon pronouncements, but the sheer scale of the shortfall in retirement funds isn’t clarified often enough. Making up the difference would require an “absurd” level of saving, according to Sinclair—in fact, if everyone saved for their retirement judiciously, the entire economy could be at risk of stagnating. There’s a risk of a generation living on dog food, he says, as governments embrace quantitative easing to depress interest rates, hammering those retirees living from the proceeds of their savings. Working out who foots the bill for an aging population is a not a task that government has embraced with any enthusiasm. It will be very difficult for the government to raise the retirement age for those on existing schemes, for both political and legal reasons. However, the transition from working life to retirement is likely to become far less distinct anyway. Over-65s are increasingly volunteering to stay in work, but this brings mixed benefits. At top-tier roles, they may block progression of junior employees all the way down the chain. Retirees who choose to take on low-skill part-time jobs are attractive hires for business owners, but they displace teenagers from the same positions. (There aren’t enough Wal-Mart greeter jobs to go around.) Furthermore, if these retirees are still drawing a pension while they work, it does little to ameliorate the financial burden of those commitments. Short of throwing open the doors to immigration, there is no quick fix to boost the number of workers in the country. Thus, politicians and society at large must engage far more with what purpose retirement holds. “We shouldn’t have people spending 25 years watching TV,” says Sinclair. “That is a huge waste.” If preretirement life is dominated by the accumulation of wealth, possessions, skills, and social ties, then perhaps post-retirement ought to be presented as a time to share those gains with society, rather than retreating from it. In general, today’s over-65s are far fitter and healthier than their parents were at this age, and they’re capable of roles that don’t fit a typical view of retirement. For some, finding a way to stay solvent in old age will still form their primary motivation. However, those on fixed-benefit pensions are more likely to only engage on their own terms. With career, family, and wealth accumulation behind them, the key may lie in identifying what personal aspirations retirees choose for themselves. Retirees may volunteer in parts of society that are typically underfunded, such as education and child care, or pursue goals without financial motivations, such as music or the arts. As the burden of an aging population on society becomes more evident, however, the existing culture of antipathy toward “shirkers” may well shift to include the indolent elderly. Even America’s senior citizens who don’t need to work could find themselves pressured into doing so by those footing the bill for their retirement. Advertisers tend to present only two visions of old age—those in need of nursing homes and 24-hour-a-day care, and the silver foxes climbing mountains. The reality lies somewhere between the two, but greater efforts are needed to accommodate America’s aging citizens in the fabric of day-to-day society. By their sheer numbers alone, America’s over-65s are destined to be a powerful political, social, and economic force. And if the rest of us hope to make it to our own retirement intact, we need them to be.